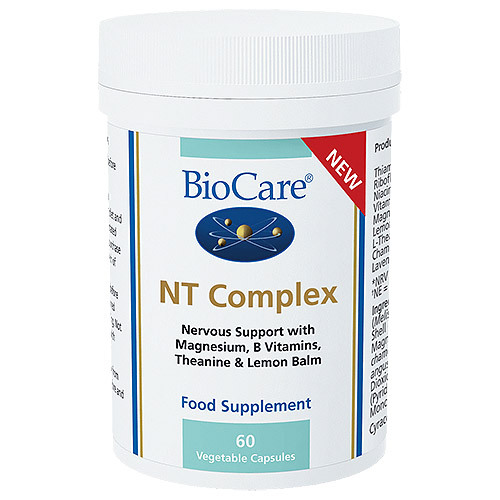 NT Complex is a unique, high potency combination of L-theanine, lemon balm, chamomile, lavender, magnesium taurate and B-vitamins to support a balanced nervous system. A healthy functioning nervous system is dependent on the right balance of neurotransmitters and hormones. Magnesium and vitamins B1, B2, B3 and B6 support energy production and nervous system balance. Lemon balm, lavender and chamomile support relaxation and healthy sleep NT Complex is in a capsule for for simple, convenient dosing and can be used every day. 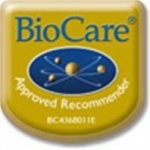 Vitamin B6 is provided in its P-5-P form for optimum bioavailability. Two per day dosage allows half dose or flexible dosing throughout the day. Suitable for vegetarians and vegans. Magnesium Taurate, Lemon Balm (Melissa officinalis Aerial Parts as Cyracos®), Capsule Shell (Hydroxypropyl Methylcellulose), L-Theanine, Magnesium Citrate, Chamomile (Matricaria chamomilla Flowers), Lavender (Lavendula angustifolia Herb), Anti-Caking Agents (Silicon Dioxide & Magnesium Stearate), Vitamin B6 (Pyridoxal-5-Phosphate), Thiamine (as Thiamine Mononitrate), Riboflavin, Niacin (as Nicotinamide). Two vegicaps taken daily with food, or as professionally directed.